Be the first to share your favorite memory, photo or story of Remus. This memorial page is dedicated for family, friends and future generations to celebrate the life of their loved one. 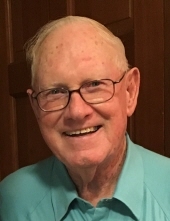 Remus Fulford of Cleveland, Georgia passed away Saturday, January 26, 2019, at White Oak Estates in Spartanburg, South Carolina. Mr. Fulford was born in Sandersville, Georgia, on May 28, 1934, to the late Remus Edgar and Luella Fulford. In addition to his parents, he was predeceased by his wife, Donnie Hester Fulford. Remus retired from the US Dept of Agriculture Rural Development (FmHA). Mr. Fulford was a member of Zion Hill Baptist Church in Cleveland, Georgia. Survivors include daughters and sons in-law, Terri and Richard Harp of Spartanburg, South Carolina, Paula and Mike O’Shields of Peachtree City, Georgia, Becky and Jarrett Bennett of Charlotte, North Carolina; grandchildren, Cole Harp, Ryan Harp, Kyle O’Shields, Katelyn O’Shields, and Britley Bennett; brother and sister in-law, Robert and Sharon Fulford of Reliance, Tennessee; as well as several cousins, nieces, and nephews. Funeral services will be held at 2:00 P.M. Saturday, February 2, 2019 at the First Christian Church with burial to follow at Westview Cemetery. Rev. George Peavy will officiate. The family will receive friends from 1:00 P.M. until 2:00 P.M., Saturday, February 2, 2019 at the church. In lieu of flowers, donations can be made in Remus Fulford’s memory to Mobile Meals of Spartanburg, P O Box 461, Spartanburg, SC 29304, www.mobile-meals.org. To send flowers or a remembrance gift to the family of Remus Fulford, please visit our Tribute Store. "Email Address" would like to share the life celebration of Remus Fulford. Click on the "link" to go to share a favorite memory or leave a condolence message for the family.